Eleven albums. Two film scores. Two books. One 18-hour set. One television show. One tragically born radio show as they sat in for John Peel. One legendary musical crescendo in cinematic history. Relentless covert digital releases and a terrifying roll call of singles. 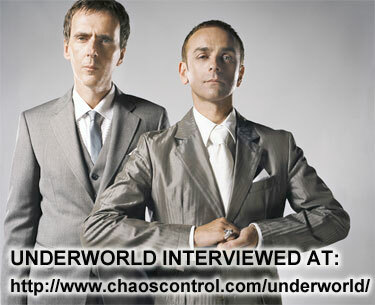 Underworld became one of the most crucial electronic acts of the 1990s via an intriguing synthesis of old and new. The trio’s two-man frontline, vocalist Karl Hyde and guitarist Rick Smith, had been recording together since the early-’80s new wave explosion; after two unsuccessful albums released as Underworld during the late ’80s, the pair finally hit it big when they recruited Darren Emerson, a young DJ hipped to the sound of techno and trance. Traditional pop song forms were jettisoned in favor of Hyde’s heavily treated vocals, barely there whispering, and surreal wordplay, stretched out over the urban breakbeat trance ripped out by Emerson and co. while Smith’s cascade of guitar-shard effects provided a bluesy foil to the stark music. Tickets still available here for $43.50.. (ouch). If this is your thang, it’s gonna be a good show and a good theater to see them in. (Side note, I saw them when I was working at the Warfield last year [or was it ’07?] and it was a damn fun show). Go! That’s really all I can say, go. Go! What is it you’re talking about, Bex? Well, the Fox Theater in Oakland just re-opened after being closed for almost 50 years. The city and surrounding businesses put something like $75 MILLION dollars into renovating the whole thing, attempting to keep almost everything original. It’s blow your mind, kick you in the face amazing. It was first built in the 20’s to show those crazy new “talking pictures”, and you can definitely feel that almost obscenely over the top glamour they were so prone to having..
That was a view from the balcony section mid-way through renovations, and here’s a final product shot..
You’ll notice what people have been calling Buddhas next to the stage, but they actually were created as warrior protectors. My own personal belief is that as long as their eyes are glowing, they are warding off zombies. Booking is done by Another Planet, who also book for the Greek Theater and The Independent, and produce the Outside Lands Music & Arts Festival and Treasure Island Music Festival. Needless to say, in the 3 weeks The Fox has been open, we’ve had acts like Social Distortion, Michael Franti, Cake, and Modest Mouse.. and future booking looks to be amazing as well. Ok, yes, this is a bit of a fluff piece because yes, I do work there.. and I have totally drank the Kool-aid and want this place to do absolutely amazing things. It’s just so damn exciting. It’s a fantastic thing for the downtown Oakland area, and for the East Bay in general. Go check it out, you won’t be disappointed.